Can You Pay Your Self Assessment Bill Through Your PAYE Tax Code? Well, they can! However, there are certain conditions involved which can prevent certain earners from participating. In this article, we will be discussing the various ways in which you can apply to pay your Self Assessment bill through PAYE and all of the benefits of doing so. You need to owe less than £3,000 on your tax bill to initially qualify. You must already be paying tax through PAYE, by either being an employee or receiving a company pension. You must have submitted either your paper tax return by 31th October or your online tax return by 30th December. If all of these apply to you, then the tax that you owe will be taken from your salary or pension in equal instalments over 12 months – along with your usual tax deductions. It is worth mentioning that you will not be able to pay your tax bill through PAYE if you’ll ultimately end up having more than 50% of your income taken as tax. For example, if you owe HMRC £2,500 and have a part-time job with earnings of £4,000 per annum, the maximum your employer can deduct is £2,000 (50% of £4,000). Therefore, your tax bill cannot be paid by deducting extra tax from your employment. Are there any benefits to paying in this way? While there are multiple cash-flow benefits, the most immediate plus is the removal of any hassle in having to pay it manually. By paying your Self Assessment bill through your PAYE tax code, you’ll streamline your entire payment process. HMRC will automatically collect what you owe through your tax code if you meet all three conditions mentioned above. It also ensures compliancy within your operation, knowing that you are steadily paying back the bill through monitored monthly instalments. As someone who earns money outside of their regular income, it provides peace of mind knowing that your tax bill is being paid. If you meet all of the requirements and would like to improve your financial strategy, then you must submit your Self Assessment by the 30th December online. Be conscious that you cannot pay Class 2 National Insurance through your tax code if you are self-employed, unless it’s been due since 6th April 2015. Finally, if you still utilise paper tax returns, then the date for submission is 31st October. It is also worth noting that, by paying your tax via your tax code, you will ultimately pay the same amount of tax on your income. 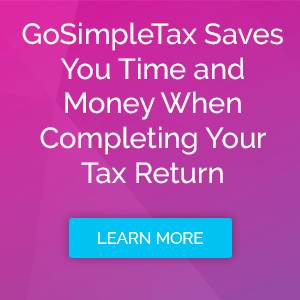 With the help of GoSimpleTax software, you can analyse the information you provide to determine how much tax you are able to claim. It can then be used to complete an accurate Self Assessment that will be sent straight to HMRC. Our web and mobile app provide useful support and guidance along the way to make the whole process as simple as possible. Test out our tax software with a 14-day free trial, or pick the package that suits you best, and see how much time you could save.